Together for the Common Good has been developing training resources in Common Good Thinking and Practice for Christian leaders and for lay people, and is set to offer their one day Here: Now: Us courses publicly from September 2018. Registrations of interest are now invited from churches and other organisations who wish to host the one day courses in partnership with T4CG. 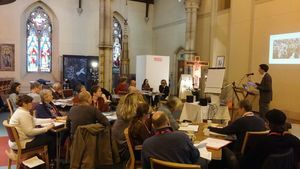 T4CG’s Here: Now: Us training materials for Church Leaders were piloted in Liverpool and Sussex in October 2017, with 70 Church leaders from different denominations participating. Second stage pilots were held in April 2018. The materials have now been evaluated and are in the process of being revised in order to meet a wide range of training needs. Training materials for Lay people were also piloted in Liverpool and Sussex in October 2017, with 40 people from different denominations participating. T4CG held a Here: Now: Us Individual's course in March in Ashford, Kent, in partnership with Together Canterbury. As of March 2018, the materials had been evaluated, revised and completed and we are taking bookings for September 2018. The third strand of T4CG’s Here: Now: Us resource - for teachers - we are in partnership with our first pilot school, St John Bosco College in Battersea, London and then possibly other schools to be confirmed. T4CG draws on the inspiration of the ecumenical partnership between my late father, Bishop David Sheppard, Archbishop Derek Worlock and the Free Church Leaders in Liverpool a generation ago. Building on their legacy, we aim to bring alive the principles and practice of the Common Good and encourage people of goodwill to work together across their differences. Advocates Group, Sussex, June update.